Combine mobile lease acquisition with web-based lease management and GIS for data accuracy and real-time insight. Rely on land management that incorporates two decades of experience, market feedback, and best practices from 100+ implementations into a single, integrated solution for the energy industry. Understand leasehold position at all times. Rely on a single source for land management data. Manage all lease activity on the go. Advice and best practices from Dejean "DJ" Pryor, Quorum's Sr. Product Manager of Land. Optimize land management with integrated features that provide robust functionality for lease acquisition, GIS mapping, lease management, and right of way. Accelerate lease acquisitions while improving the accuracy of your data with web-based software for landmen and brokers. 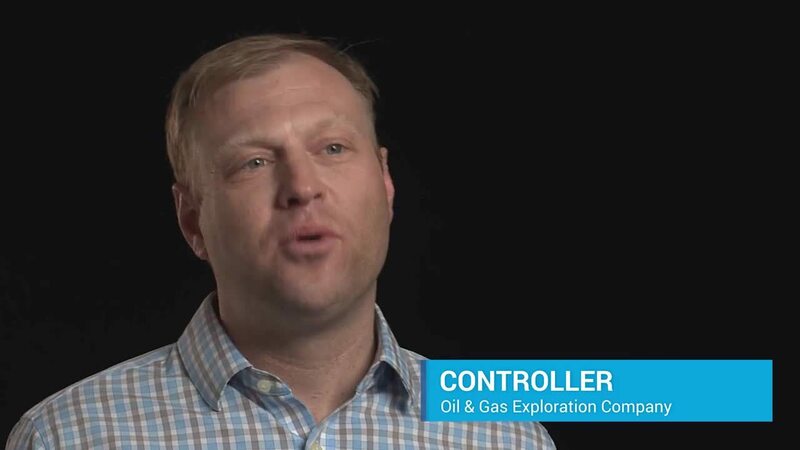 By creating real-time connections between land professionals in the field and your land department, you can secure mineral rights in the best exploration areas faster. Leverage built-in workflows to establish ownership, track progress, and review and approve agreements instantly. Accelerate lease acquisitions with our mobile-first, web-based software. Learn about the industry's most widely adopted lease acquisition software, integrated with leading land management. See, analyze, and understand geospatial data with Esri® extensions that offer real-time insight into leasing and title activity. 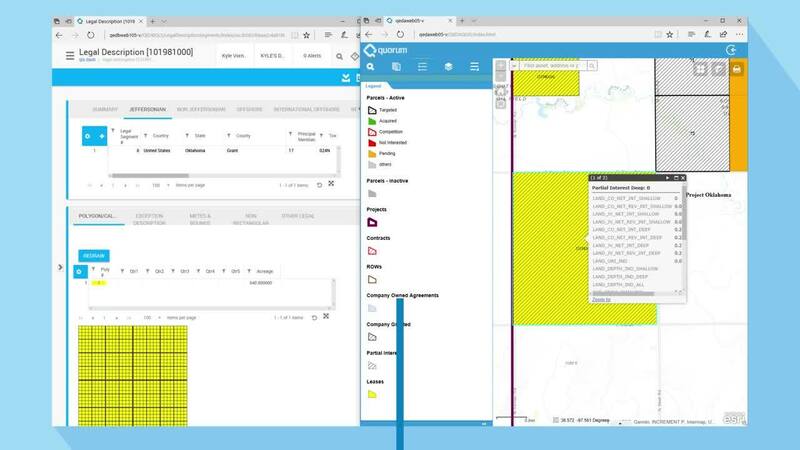 See, analyze, and understand geospatial data with Esri® extensions that offer real-time insight into leasing and title activity.By combining interactive mapping with a single source of truth for land management, your entire company gains insight into your most important assets. Learn how full mapping integration with Esri® ArcGIS spans lease acquisition, title opinion, and lease management. Manage the entire lifecycle of your most important assets, from acquisition to disposition, and by specific depths and formations. Rely on a single source for land management data, in a complete solution that offers industry-proven functionality and workflow automation for lease and title analysts, land administrators, and other land professionals. Discover an all-in-one solution for better land management. Read about our complete, web-based solution for lease and title analysts, land administrators, landmen, and other land professionals. easements, surface rights, permits, and more. Comprehensive project planning and management make it possible for companies across industries - oil and gas, alternative energy, transportation, and more - to streamline right-of-way activities. Read about our complete solution for managing right of ways, contracts, leases, fee properties, and easements. Are you just getting started? Explore myQuorum Land On Demand, cloud-based land management designed for small energy businesses. Pre-packaged to meet the needs of your growing business, Land On Demand includes software, services, and premier support to have you up and running in days with land management that’s best-in-class: proven, affordable, and fast. From startups to supermajors, 100+ companies of all sizes rely on our integrated solution for lease acquisition, GIS mapping, lease management, and right of way. Here's why. 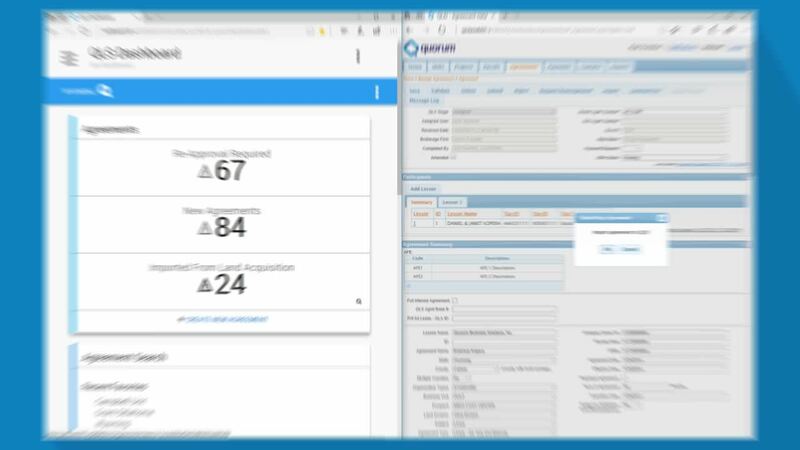 Reduce severe downtime using the myQuorum platform by being able to carry out actions straight from the comprehensive dashboard. 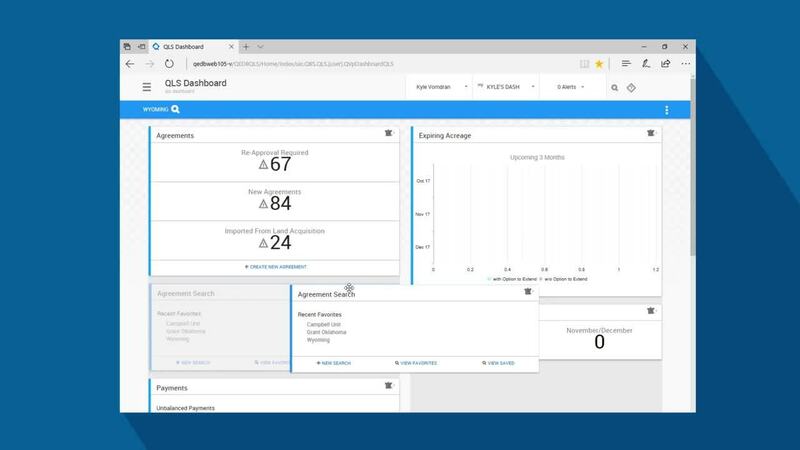 Tailor the dashboard to your specific role within the organization. 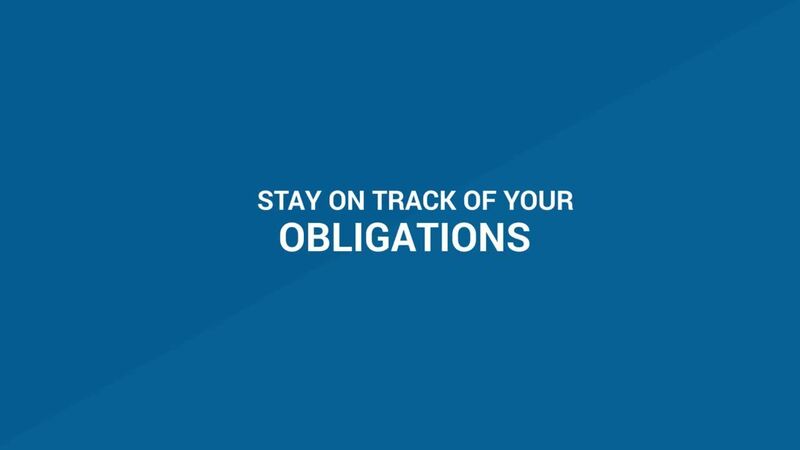 Manage all agreement activity, upcoming payments, obligations, and expiring acreage straight from the dash. Perform an agreement search or search to different parts of the application such as reports. Work smarter and reduce manual work by automating your overall processes with sophisticated tools and functionality. Automate data entry and auto map polygons for specific agreements in certain legal descriptions. Stop relying on reports for data - you can easily find any land data in seconds using powerful search capabilities. Trust the accuracy of your data with the ability to input data once and access it in multiple places as well as receive alerts when information is incomplete. View a full audit history to know who made changes and when. Reduce data entry time by importing agreements from lease acquisition to management. Receive warning alerts if data doesn’t match or is incomplete. Capitalize on your technology assets by investing once in a fully integrated solution that scales to meet your business needs. Gain real-time insight into your leasehold position with integrated GIS mapping from Esri. Monitor broker performance and track complete agreement details: lessor names, negotiation notes, mineral interest, acreage, and more with integrated lease acquisition. Access information directly from myQuorum Land Management with embedded reporting.